Recollections are often biased to recent events. A list of the best albums of all time can often be disproportionately weighted with music that was riding high in the charts just the other day. So picking the Tour of Lombardy can seem a recent recollection but hopefully it stands the test of time. As ever the course keeps changing. There are lessons good and bad here, on the positive side the alterations keep the peloton guessing as they stops the self-reinforcing phenomenon of riders waiting for particular parts of the course to deploy their tactical schemes. Conversely it leaves the race with an unsettled feel, as if it struggles to find the right formula but this is comforted by the regular big crowds, this region of Italy is one of the sport’s heartlands ranking alongside Flanders, Brittany or the Basque Country and always something to celebrate in the light of the sterile scenes in Qatar in the same month. This year’s route was hilly bordering on mountainous and included the staples of the Madonna del Ghisallo or the Valcava. But there was this flat section of 15km, all on big roads, before the finish in Bergamo and the worry was this would let the strong teams reel in any breakaways and set up their riders for the finish. Plenty of climbs did plenty of damage and with 60km to go roughly 75% of the peloton was out of contention and many of those visibly in contention were bound to crack. A flurry of attacks were being launched. Movistar were on manoeuvres as Giovanni Visconti tried a move to soften the field for his leader Alejandro Valverde. Esteban Chaves and Rigoberto Uran jumped, Romain Bardet gave chase. 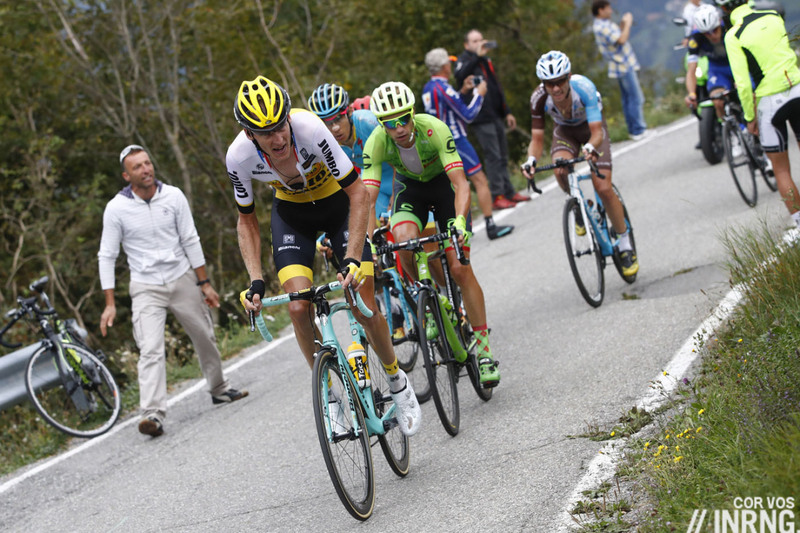 Robert Gesink launched a move too that teased apart more climbers from the rest. At the Selvino climb and Esteban Chaves launched his move with 35km to go. The previous week he’d won the GP dell’Emilia, reportedly taming the slopes to the San Luca basilica in the big ring to beat Romain Bardet. Now Chaves was away again with Bardet and Rigoberto Uran joined them. Fabio Aru but it soon became apparent the apprentice was better than his master and having narrowed the gap to the lead trio he jumped across to form a quartet. Knowing the dreaded flat run to Bergamo meant watching the action but worrying all these early moves were in vain because a few stick-legged climbers could be reeled in like minnows by the substantial chase group. Only if there were teams with numerical superiority in the finish but this included Ag2r La Mondiale who had Pierre Latour, Cannondale who had Davide Villella and of course Astana with Aru, all of these riders were policemen tasked with dampening the chase. 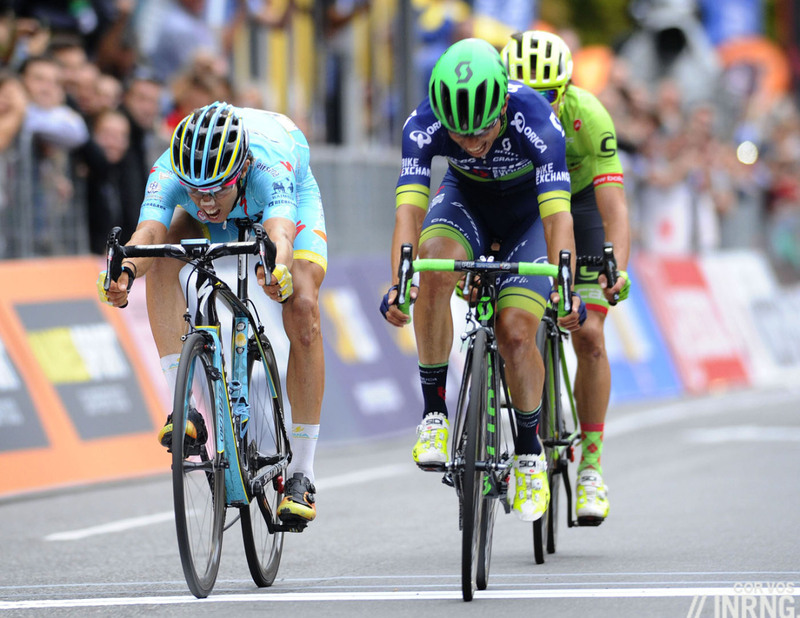 Ahead the quartet pressed on as a unit but their lead was slender which added to the tension as Movistar gave chase. Someone had to win but the calculation was not obvious in the moment. Rosa had done so much work and would surely be delighted with a podium finish, plus he was not an obvious winner for such a big race. Chaves was the local given he’s lived nearby since turning pro after winning the Tour de l’Avenir but he’s is a climber but could he sprint? Bardet’s gone up a gear this year. Perhaps on paper Rigoberto Uran was the best sprinter but he’s not looked the same all year. Rosa was the first to attack and from the comfort of a keyboard this was a rookie mistake and then Chaves went which made you fear he’d blown his chances for the sprint but the acceleration blew away Bardet. Rosa tried again but couldn’t get away. It was advantage Uran over the top of the climb and a gripping finish for neutrals, Colombian supporters must have been going wild. 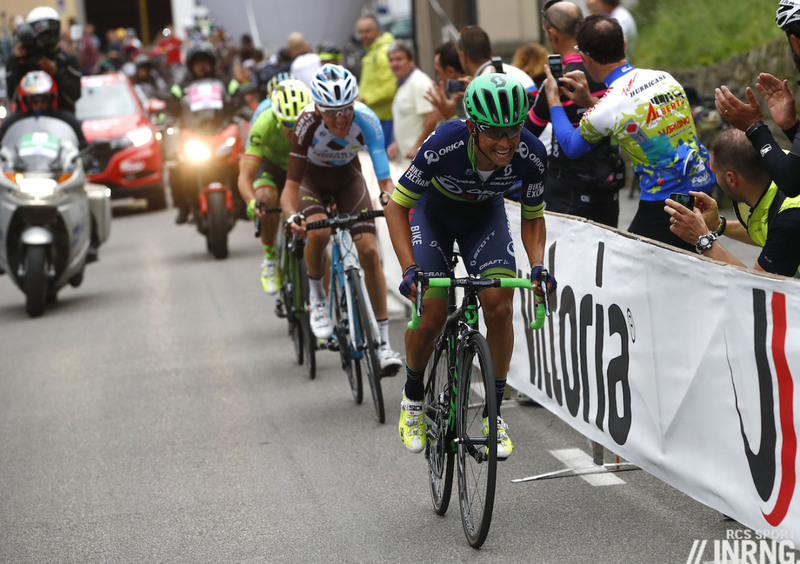 As they came into the finish Rosa looked set for the win but Chaves wound up a long sprint to win by centimetres. With hindsight: a big one day win for Chaves and the first Colombian winner of a Monument classic and the first non-European to win Lombardia and the result helped Colombia top the UCI’s nations rankings, something few care for but indicative of this nation’s status. Was Rosa the stronger rider? Perhaps but he wasn’t the cleverest although he had to use up a lot of energy on team duties. Rosa’s signed for Team Sky and will be another precious climbing domestique. 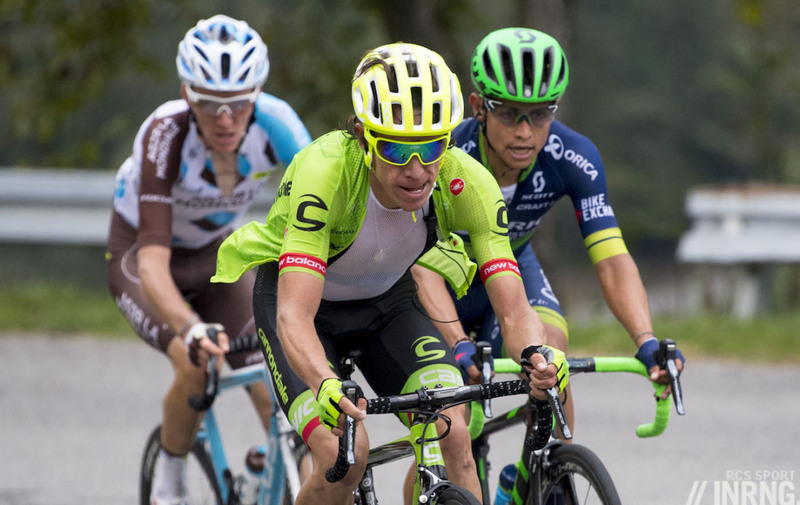 Among the results Davide Villella was fifth and finally coming good, he’d go on to win the Japan Cup and should improve in 2017. Pierre Latour was 22 on the day and made the top-10 after a very active day at the front of the race and fellow Frenchman Warren Barguil, aged 24, was back after his accident in the top-10 too. Why the highlight? it’s hard to pick one moment over another as there were many great moments in the year. This one got picked to celebrate stage racers taking long range risks, the sight of them going for the win a long way out, getting the rewards and proving a thrill along the way. This applies to the breakaway and the winner in Chaves who attacked several times and still won as opposed a cagey win by someone else and if it was late in the season the race had a stellar startlist and a ratpack of top riders trading attacks from far out. Yes recent events can crowd out older memories but it’s also true that the longer the season goes on the greater the race needs to be to grab our attention and this was captivating for the final two hours. In terms of one day races with lots of climbing I think both thiis race and the olypmic road races showed what you need to make it exciting is the flat finish as the climbers have to do there thing early rather than sit-in as in the Ardennes races. Anyway thoroughly enjoyed this season closer, thanks for the write up. In ring, I would love to read your take on the olympic road race. My personal favorite of the year and the most entertaining olympic road race ever. The men’s or women’s race? Both were good and exciting but I hesitated over them as a lot, and perhaps too much, of the drama and the final result were prompted by the crashes. This doesn’t reduce GVA or AvDB’s wins – to finish first, first finish – but it damped the joy of the moment a bit. An interesting aside to INRNGs choice of classic, is the secondary discussion on the event parcours. The Tour of Lombardy indeed shows other classics organizers what is required to develop their events for the modern era. Courses which have been unchanged for 100 years, with the noble exception of the cobbled classics, need to progress and change the nature of their parcours, without changing the overall event character, to cater for improvements in equipment and rider ability. I don’t actually feel the Tour of Lombardy has lost any of its character by changing the course. It has stuck with a similar geographical area. Think how easily the riders now appear to climb the Madonna del Ghisallo. Just 30 years ago this climb was considered a significant and challenging climb for Professionals. It’s still unmistakeably Lombardia with the variety of climbs, the lakes, the cyclists cheering beside the road and so on. The Ghisallo surely remains a hard climb if it’s late in the race because the steep start out of Bellagio is highly selective and the rest of the climb is testing with 200+km in the legs. I have to say that the Giro di Lombardia was my biggest disappointment of the year. My memory is hazy but I think there was 4400 metres of climbing. That isn’t bordering on mountainous that’s a full on day where if it was a stage of a grand tour you’d expect just the pure GT contenders to come in at the end with big gaps. And that’s pretty much what happened. That isn’t what one day racing is about for me. To put it into perspective the last time they finished in Bergamo when Martin won but you had punchuers in the mix as well they did 3000 metres of climbing or so. This was done on purpose to try and build a course for Aru and Nibali to my mind. Unfortunately for them Nibs didn’t make it but at least they got Rosa in the finale. This bothers me because I’m sick of races just being about how many climbs they can fit into a set distance these days. My rant probably doesn’t make a great deal of sense but I’m sticking by it! I see what you mean but this was GC contenders having to race hard rather than play the percentages and calculate the watts; something we expect from Bardet and Chaves most of the time but good to see too. Amstel with approx 1700m total altitude gain, L-B-L with almost 3000m, and Flèche Wallonne on 1750m. It was still a cracker jack of a race though. RCS not afraid to tinker. Last year’s was great too, I can still picture Nibali’s descent. You’re right of course, will fix that. This year hasn’t worked out well for Aru. A great race and definitely one of my highlights for the year. 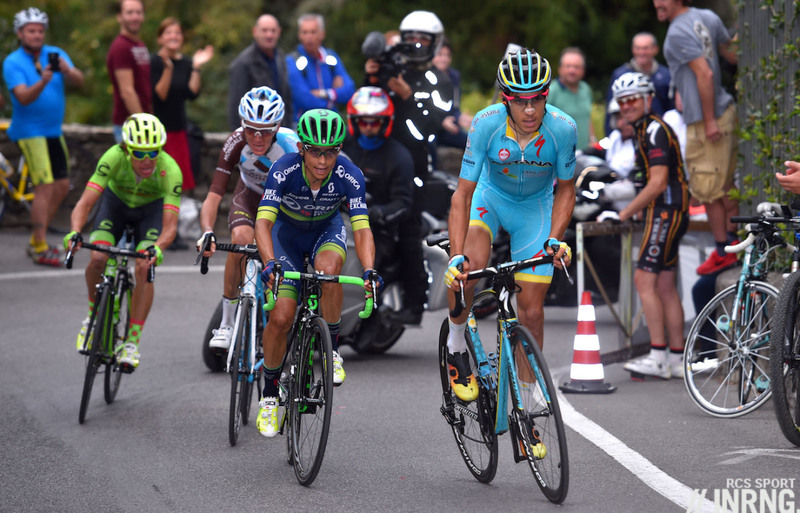 Lombardy adds diversity to the Classics and brings different riders into contention. Gripping race and I was heartbroken when Bardet was dropped, this would have been such a great one for him – and given how much time he made up in the last flat section it could have been so. But full credit to all four of the quartet, all rode absolutely brilliantly. I hope Rosa’s new employers give him the chance to be in this position again. Nice write up Lombardia was deffo one of my favourites as was the penultimate stage of Lavuelta! I get the point of those saying that perhaps this edition was a bit too mountainous for a Classic. Yet, we shouldn’t forget that we’re speaking of a Monument, that is, a race which has got its own tradition, which includes from its very first editions a long list of winners who also won, say, the Tour de France. I’m well aware (and someway nostalgic) of the lack of specialisation during cycling’s early ages and then all the way into the Seventies, at least when we’re speaking of top riders, but we shouldn’t forget that, right after the Golden Age of Coppi, the race used to be won also by athletes who could be qualified, even then, as more or less pure climbers, like Taccone, Motta, Bitossi or, later, Baronchelli, quite far from the prototype of a pure Classics-specialist. The race always lived different eras, within each of which different editions could be shaped: just after a GT-friendly moment between the ’80s and the ’90s, when stage racers or climbers like Rominger, Mottet, Chiappucci, Bugno, Lejarreta, Richard were winning or podiuming, the millenium switch brought in more Classics-specialists, only to have the momentum favouring GT riders again in recent years. The Valcava climb, late in the Eighties, had half of the peloton walking its way up: before the compact or the 39×28 became an option for the pros, that was *mountainous* enough! Fignon gave up, imagine that, no realistic option for any pure one-day racer. That was happening some thirty years ago, not the other day. Which doesn’t mean that you couldn’t have the odd sprinters’ edition on a different year with an easier course. I think we should happily accept the *traditional* quite climbing nature of the race along with its *traditional* shifts in course which, from time to time, *do* offer some more chances to different profiles of riders. I agree that a perfect race should allow one or two Classics-riders in the final mix, but perhaps this year nobody was simply good enough, come October, because the Olympics offered a rare occasion precisely for that kind of riders. Or, might I add, we should notice that, with Valverde and Gilbert getting old, the best one we presently have with those qualities is GVA, who, albeit a great rider, isn’t on the same level of most of the *historical* athletes I named above. 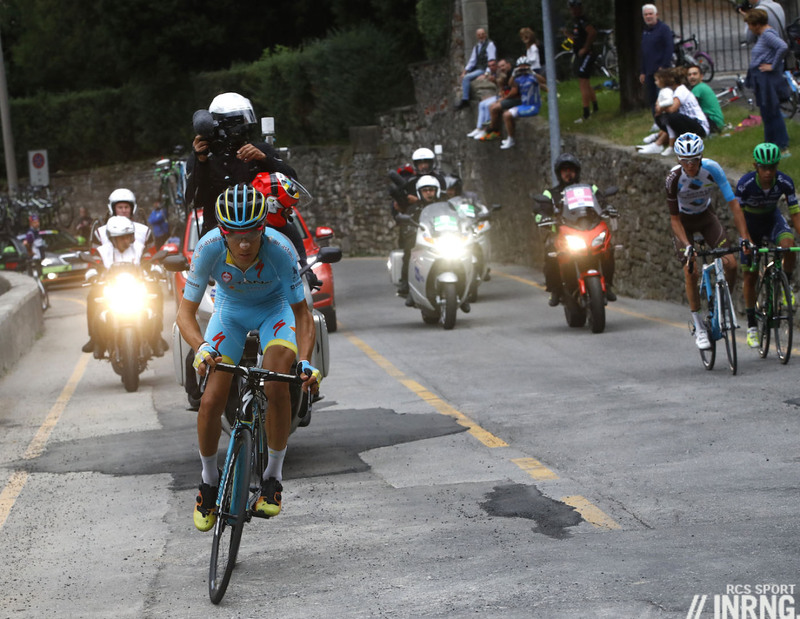 After all, Gilbert won the hellish 2010 edition over Scarponi, Lastras, Fuglsang, Nibali, S. Sánchez, Nieve, Santambrogio, Barredo, Caruso, that is, sort of 9 climbers. Bettini good best a Giro winner and a TdF podiumer in another climbers’ edition. In short, be (*really*) good enough and you’ll possibly be around, no need for the course to make things easier. Those victories will become even more special, and not just, say, another San Sebastián with worse weather or an autumn B-version of L-B-L. If you think about that, we don’t have many GT riders fighting for the Roubaix, and it’s all hats-off (rightly so) when a more or less modified stage racer grabs a top-ten. I think that both Roubaix and Lombardia actually work great (in fact, this year they both made the very selected inrng’s highlights shortlist), no need to worry too much about their format, if they keep going like this. It’s Liège which in recent years has being showing greater problems – despite having a good mix of different kinds of riders fighting for it. Whoa! What a comment! It’s longer then Inrng’s article! I hope Inrng has a special mention for the highlight of the season lists being your comments. Can’t wait for Part V! There may have been “better” races/stages, but I’m hoping for the Worlds. Could there have been a greater disparity between low expectations and actual result? Previous post: Why Have So Many French Cafés Closed?